Currently my html preview/output is not working and I wonder if you can help me with that. Yesterday I updated an old non-responsive design project which had been working fine so far. I added some more in build states to multistate objects (clicked state) and some advanced actions to also change the state of these buttons if slides had been visited on entry. Apart from that I only changed some Smart Objects and some minor stuff like positioning and so on. Since that change my preview in HTML wont work anymore, I just get this icon indefinitely and it wont load any further. However the “standard” preview still works fine. SWF in Browser works as well. Previewing other projects in HTML works fine. I am using the latest Adobe Captivate Version. If anyone has an idea, why this could be an issue, please reply! The post HTML preview/output not working appeared first on eLearning. Responsive Project: Why does image get small and text stay large on devices? Can someone help me figure this out please? I have the text caption and image looking good on desktop, but when I switch to a device, like an iPhone 6, the text doesn’t adjust down (so it’s too large) and the image becomes very small. The post Responsive Project: Why does image get small and text stay large on devices? appeared first on eLearning. Jan 31st 2019 will remain as a day to remember for both myself and Pooja Jaisingh as it is the day our second book has been published by Packt Publishing. “Mastering Adobe Captivate 2019” is the fifth edition of the “Mastering Adobe Captivate ” series and the second that Pooja and I co-author. Once again, we have been privileged to work alongside some of the greatest experts of this very community. Special thanks to our friend Kirsten Rourke for being such an thorough reviewer. The community has always been at the heart of the “Mastering Adobe Captivate” series, and this fifth edition makes no exception! In this last edition, we have included the latest features of Adobe Captivate 2019. There is for example an entire chapter on Virtual Reality projects as well as a new section about Interactive Videos in the chapter on Interactivity. The chapter on Responsive Project has been upgraded to include the latest enhancements of the Fuild Box 2.0 of Adobe Captivate 2019. We have also removed a few sections about legacy objects that are not supported in Flash. Since the Flash player will cease to be supported next year, we thought it was time to remove these objects from the book. For example, we have removed the sections on Text Animation, Rollover Captions, Rollover Images, etc.. We have also updated the exercise files accordingly. So after 5 month of hard work, we are very proud to have come up with the most comprehensive book ever on Adobe Captivate. If you are a Captivate newbie, this book will teach you the features of Adobe Captivate in a friendly step-by-step manner. If you are a Captivate expert, you can use this book as a reference book. The chapters are designed to be self-contained, so you can skip the chapters you already know about and read the book in any order you want! If you are a Captivate Instructor, you can use this book as your courseware. The chapters propose a logical step-by-step approach and you can download the sample files to teach a flawless and comprehensive Captivate class to your students! How can you grab your copy? The book is available in various formats including eBook (PDF, Mobi, ePub, Amazon Kindle, etc.) and print copy. If you have read the book, don’t hesitate to drop us a line about what you liked / disliked. This will help us come up with the next edition. and don’t hesitate to contact us should you have any question about the book! All in all, we are very proud of this achievement. We are confident that this new book will help people Master Adobe Captivate and build incredible eLearning modules with one of the best authoring tools around! 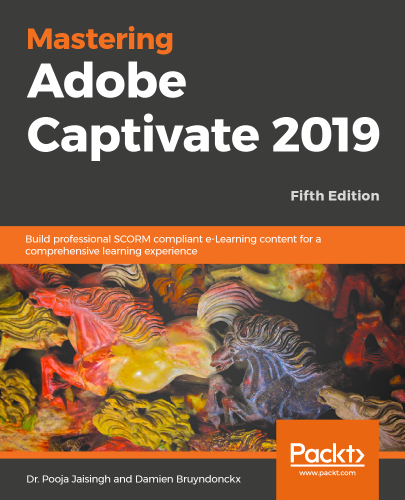 The post New Book – Mastering Adobe Captivate 2019 appeared first on eLearning. I created a bunch of projects in Captivate 2017. 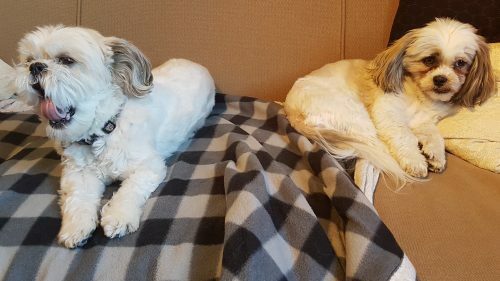 We now have to update them for a new software release. A colleague of mine has been helping me with edits. She has Captivate 2019, I have Captivate 2017. When I send her my files, she is able to open them just fine. But when she sends them back to me after editing them, I can never open hers. We use the same methods and tried several. Would the difference in versions really make it impossible for me to use her files? Am I now forced to update to 2019 if we are to be able to collaborate? Or is that not the problem here? Any ideas for what else we could check/try? The post Can’t open files edited by a colleague appeared first on eLearning. I have been working on a responsive project for a few weeks now and cannot seem to get the setting correct for the project to scale correctly. The project is very simple, screenshots of an app with click boxes over icons on the picture to show the learner how to walk through the app. At first I was using fluid boxes but then I realized that when viewed on a smaller device the whole image does not show (the bottom is cut off). I switched to break point view and the picture is shifted right and it is cut off on the bottom or does not fill the screen. We have tested in an iPhone 7 and an iPhone XS. I have looked at some blog posts and discussions and I haven’t found anything on how to get the image to scale correctly. I think the big part that I do not understand is the position settings, such as if I should use px, %, % relative, etc. The post How to Scale Responsive projects in adobe captivate 2019 appeared first on eLearning. I restarted my computer numerous times, tried downloading and installing it again, and can’t get past this message. Any leads are appreciated. Thanks. The post Captivate 2019 Error Message 183 appeared first on eLearning. I’m trying to package Captivate 2019 for enterprise deployment but need a .msi for the installer media. 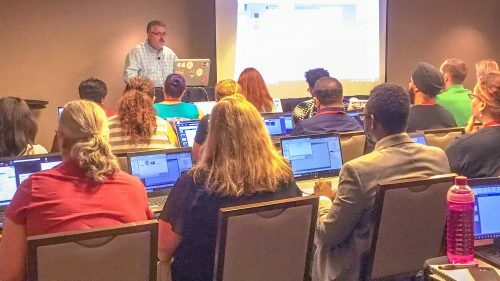 The post Captivate 2019 .msi appeared first on eLearning. I’m trying to earn a free Adobe Captivate license by contributing to the community through showcasing my work. 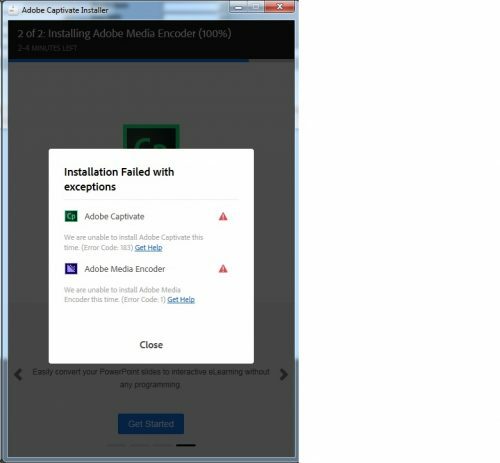 The catch is Adobe’s system won’t accept my zipped project and I’m assuming this is because I created it with the free trial and the project is set to expire in 30 days. If that’s the case it seems like this is either an oversight in the incentive program or a pipe dream. Does anyone have any information on the matter? I tried contacting Adobe but was basically told, “the marketing department handles that”. They did however, attempt to upload a project created from a trial and was unable to do so, affirming my theory that I couldn’t upload a project created from a trial. Is there anyone who has more info on this or can help me get my first couple of projects published? The post Points, Levels, Badges and Pipe Dreams appeared first on eLearning.